Lissotes latidens, copyright Peter McQuillan. The Lucaninae are a group of stag beetles characterised by partial or complete division of the eye by a canthus, strongly geniculate antennae, and widely separated coxae. [B27] Brookes, A. E. 1927. A new genus and three new species of Coleoptera. Transactions and Proceedings of the New Zealand Institute 57: 563–566. [CH92] Cassis, G., W. W. K. Houston, T. A. Weir & B. P. Moore. 1992. Zoological Catalogue of Australia vol. 9. Coleoptera: Scarabaeoidea. AGPS Press: Canberra. [H15] Hedley, C. 1915. Presidential address. Journal and Proceedings of the Royal Society of New South Wales 49 (1): 1–77, pls 1–7. [Mac86] Macleay, W. 1886. The insects of the Fly River, New Guinea, "Coleoptera". Proceedings of the Linnean Society of New South Wales, series 2, 1 (1): 136–157. [Mas86] Masters, G. 1886. Catalogue of the described Coleoptera of Australia. Part III. Proceedings of the Linnean Society of New South Wales, series 2, 1 (1): 21–126. [MC92] Moore, B. P., & G. Cassis. 1992. Lucanidae. In: Houston, W. W. K. (ed.) Zoological Catalogue of Australia vol. 9. 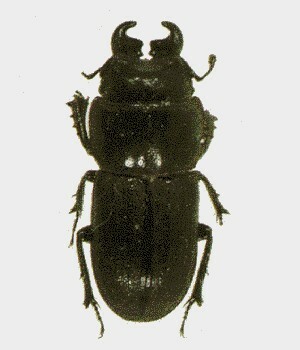 Coleoptera: Scarabaeoidea pp. 4–19. AGPS Press: Canberra.